I have always loved breakfast treats, there are always so many types to choose from. Danish, muffins, coffee cakes, doughnuts, cinnamon rolls, biscuits, popovers, scones...It's the details that really make the difference (in my opinion of course). A fresh picked fruit, compound butter made with sweet orange zest, a sugar topping, or a creamy glaze would all add to a basic breakfast treat to make it amazing and memorable. I feel like everyone has somewhere that they remember for certain foods where that food was delicious and they always want to go back again. I have one for basil mashed potatoes that melted in my mouth and provided a burst of flavor as I ate them, one for a simple lemon cupcake topped with a small lemon candy and an edible shimmer glaze, even one for the best hamburger I've ever had (don't tell anyone though! that was one of the last burgers I ate before turning vegetarian). Do you have a favorite place for a certain food? Maybe you've only had the food once there but you will remember it forever! Have you seen the "Cronut" craze that's going on right now? It's crazy, there was another article about it today because of the problem with people scalping them. It's a cross between a croissant and a donut, if you're not familiar. They're supposed to be amazing, so amazing in fact that people are paying $100 for 1. Yes, one. To me, that's crazy. But to some people? apparently not. I sure hope it's delicious since you can wait in line for a long long time but it would only be $5 each. There are copycats popping up across the country too. I've always loved combining desserts or food and coming up with something a little different. 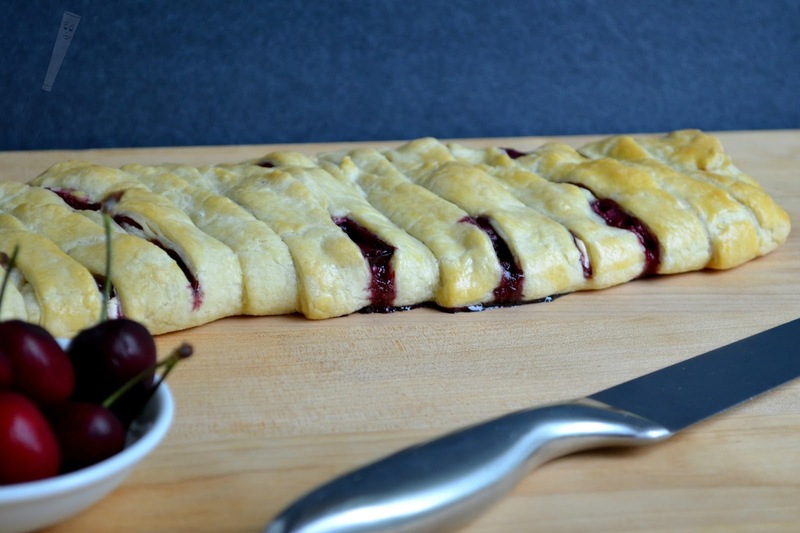 The Cherry Cheesecake Braid I made is a perfect example. The dough is a little thick and soft on the inside like puff pastry but the outside is crunchy and offers a paper thin layer on top like phyllo (or filo). It's a lovely combination like I've never had before. 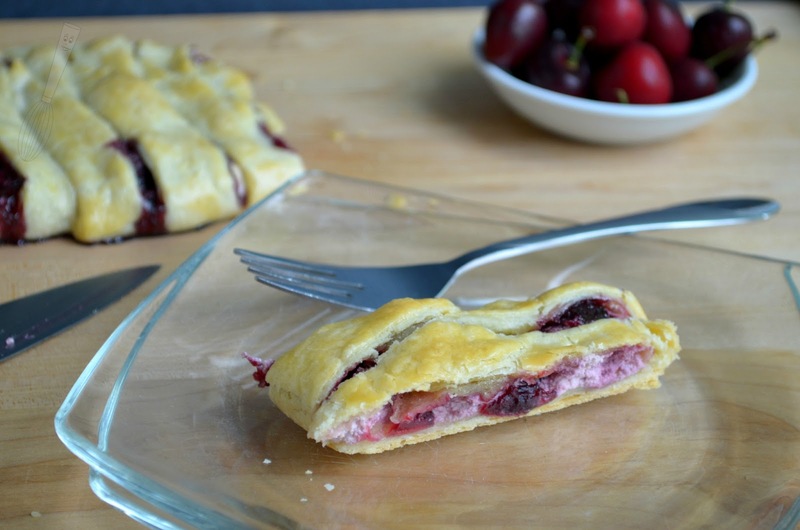 The lightly sweet cream cheese complements the sweet, fresh cherries. It makes a pretty presentation too! 1. In a food processor, mix together the flour, butter, and salt until the butter is in pea sized pieces. Add in the egg and pulse several times until it is mixed in, then add 2 tablespoons water slowly through the feeder tube while the processor is being pulsed. Pulse several more times until a smooth dough is formed. 2. Turn the dough onto a lightly floured surface and knead about 1 minute. Wrap in plastic and chill for at least 1 hour. Meanwhile, mix together the cream cheese, vanilla extract, granulated sugar, lemon juice, and half and half until smooth, then set aside. 3. Preheat the oven to 350F. 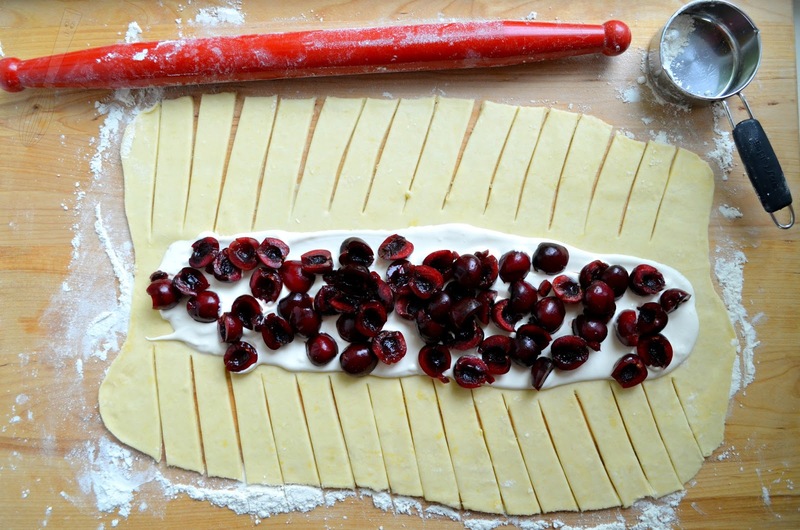 Roll out the dough into a large rectangle (on a piece of parchment paper or on a Silpat), about ⅛”-¼” thick. Spread the cream cheese mixture into the center third of the dough. Cut the sides into angled strips about ½” thick. Top the cream cheese mixture evenly with the chopped cherries. 4. 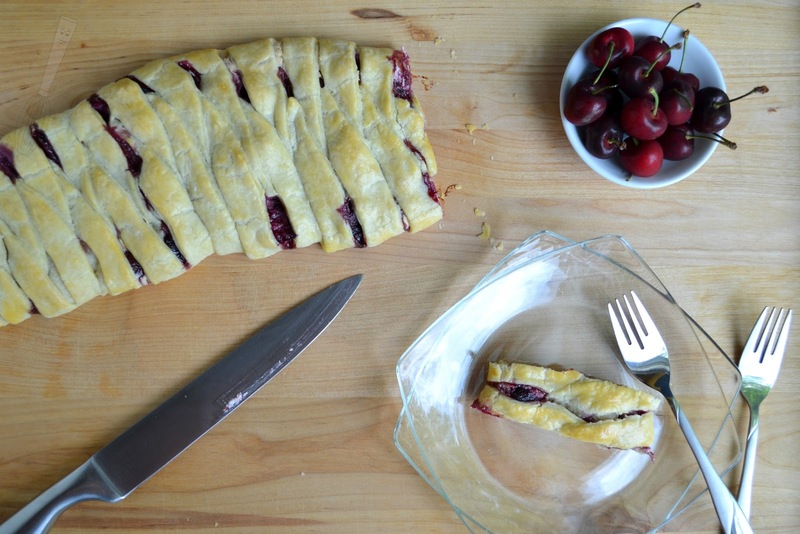 Starting at one side, fold the strips over the cherries while alternating sides to create a braid, ensuring the ends of the pieces are always covered by another piece. Move the braid on the parchment or Silpat onto a cookie sheet (if you haven’t done that already). 5. In a small bowl whisk together the whole egg and 1 tablespoon of water until smooth, 45-60 seconds. Brush the egg mixture on the braid until it is evenly coated. Sprinkle the dough with additional granulated sugar if desired. 6. Bake the braid for 35-40 minutes or until golden brown. Cool about 10 minutes, then serve warm.